Traveling by 'local', the public transport system - (similar to a subway) within Mumbai is an adventure. However the journey is more interesting due to the people and conversation during the commute. During my last visit, came across an amazing exchange of content facilitated by technology and innovation. The person standing next to me was holding the rails to steady himself in the train with one hand while holding his phone in the other. I noticed that he was watching a Bollywood movie with headphones in his ear. The person standing next to him looked at his phone screen, tapped on the shoulder to confirm if this was the latest movie that he was watching. Happy with the affirmative reply, the second person immediately asked the first person to share the movie to which the first person readily obliged. Over the next couple of minutes, the second person helped navigate the options on the first person's phone, showed him the settings, file manager, etc. and ultimately got to the screen for sharing the movie. The movie was shared and both persons were now individually watching the movie on their phones. I had witnessed was an everyday example of Indian jugaad or rather the way of life in India. Also to think of the rate of proliferation of media content as a result of smartphone penetration in India is quite amazing. For 2017, estimated number of smartphone users in India is expected to be 300 million. Quite an opportunity for a lot of entrepreneurs to play in this space! Entrepreneurs have always propelled this economy. It all begins with the drive to create change. The unique breed of people ride the roller-coaster of building a business and have fun doing it. The inspiration for the this post is from a talk I heard at TiE Boston by Nitin Nohria, Dean of Harvard Business School. He spoke about the trend where currently all businesses are SMAC. SMAC = Social, Mobile, Analytics, Cloud. Nitin Nohria identified healthcare and robotics as the two fields that will emerge besides the SMAC businesses. I believe moving forward the value creation and innovation will happen when this current trend of technology applications interacts with other fields. For example, using mobile devices for delivering healthcare - think telehealth; using cloud computing capability of the business for agriculture - think quickly responding to changing environmental conditions based on multiple data points, etc. For entrepreneurs, we always hear about aspects of having a good team, great opportunity, funding, network of family/friends or ideally business prospects, etc. I will elaborate my thoughts on some of these topics below. You can't build a great venture without a great team. The goal is to have simple functional teams that can perform the work. Also critical is to understand that building a great team is not necessarily having a group of your best friends, although it might be good fit if there are complementary roles. We always hear cash is king. For entrepreneurs this translates to why sales is king. We think about the market price at which cash is available. Ventures fail because they fail in customer acquisition. People underestimate sales cycle. Don't run out of customers or cash. Entrepreneurs need strong beliefs. Entrepreneurs need exaggerated convictions. Entrepreneurs also need truth tellers. This is why trust is key between entrepreneurs and mentors / advisors. As one goes through the highs and lows of entrepreneurial journey, this group of people show us the compass, to point us in the right direction and keep us oriented towards the end-goal. All businesses need to have a business plan. From an investors point of view the important thing to evaluate is whether the business looks like the business plan? Everybody invests in a business plan but plans mean nothing. Planning is everything. The imperative thing for entrepreneurs is to be permanently adaptive. One should have belief in the plan but continue to evolve. This is where the business should have the capacity to pivot in case things don't work according to your plan. Yet, when we look at the sky-high valuations for many of the SMAC businesses, I wonder if we are in a bubble. The only comparison point I have is the Dotcom bubble, and believe that the current situation is quite different as the startups have an underlying infrastructure this time. This results in the potential for value creation. 3. Once you go down the entrepreneurial path, never ever give up and you will succeed. Entrepreneurs are the true rocks stars and especially in today's economy entrepreneurship is the platform for success while keeping the curiosity and hope alive. Sleep to Remember; Remember to Sleep. Sleepless in America by National Geographic Channel exposes the crucial need for sleep and the shocking life-threatening consequences of its absence. Over the past few years, I have worked in different places where the behavior and personalities of certain people have shaped my experiences at the organizations. You will hear this phrase many times uttered by CEOs: "Human capital is the greatest asset at our companies." After all, the work is done by the employees. One of the reasons that triggered this post is that nowadays always some pair combination of managers, leaders and entrepreneurs is used to define business people. The below descriptions dig deeper to explore these three types of personalities, an employee often encounters in an organization. Manager: Typically, I find managers results driven (in a good way) with an understanding of the capabilities of the system. Managers accordingly plan, execute things. The expectations from employees and result mean everything and often, and there is a structure or process driven aspect to working for a manager. I have had managers who tend to oversee every little detail and it was essential to set appropriate plans, priorities and milestones to effectively work in such a situation. As there are defined metrics on evaluation of your work, these set the ground-rules and boundaries for an employee to work towards meeting the key performance indicators. People at consulting companies are typically great at management in a corporate setting, however as we know, you should manage to lead and not lead to manage. I believe the relationship with the employee makes the difference, as an employee is either working for someone to complete a task or ideally working with someone on a task. Leader: Yes, you guessed it right. These are people who inspire the group towards a common goal and are usually running the department or the organization in most instances. The couple of things that have stood out for me that a leader has are: a great grasp on clarity of thought and creating the environment to achieve success. The metrics for accountability actually help the employee to be rewarded for the hard work and motivates one to aspire and contribute to the goals. You are part of the team. Successful leaders are genuinely interested in developing skills of the employees and actively empowering the group, encouraging to even step outside the comfort zone. While working with leaders, I have often found myself acknowledging failures, yet focusing on the learning component to continue working towards the project goal. The expectations to meet deadlines is always here, but the employee has the belief to accomplish and do great things for their team / department / company. Entrepreneur: I wish I knew all the traits that define an entrepreneur. At the core, the passion and focus to create something using the available resources, drives an entrepreneur. The end goal always evolves, hence the approach is flexible. The advisors and mentors do a great job to give unbiased feedback to maintain objectivity in pursuing the product goals. The employee in a startup typically wears many hats, doing a multitude of functions, and is caught in the exciting journey while working in a dynamic environment. I feel one needs to understand the strengths of the team and each individual to be the most productive, as the team has the capacity to be nimble, task driven and innovative at the same time. As the team grows the organization needs to bring in people with management skills to ensure smooth running of the projects. This many times affects the working structure as more processes are established to scale the organization. The employee needs to understand the short term goals but be cognizant of the product vision. Hiring employees is one of the most critical jobs for an entrepreneur to build the right team for the product / company. Amongst the many things, a can do attitude and ability to execute are the attributes an entrepreneur cherishes in his/her employees. 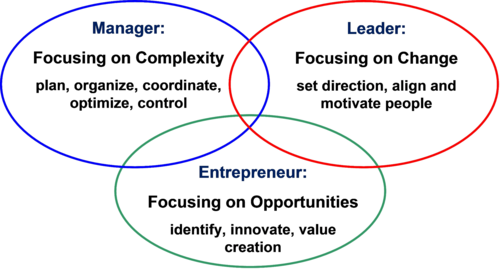 There is definitely an overlap among the three categories and it is hard to find people fitting these archetype of roles. I believe, greater overlap between these personalities leads to a better outcome in most instances. To oversimplify things, entrepreneurs imagine products, managers build these to scale and leaders create organizations. Productivity in the work setting is affected by many factors, however from an employee standpoint, the one thing that defines the working relationship is trust. Within the organization, other factors like culture, talent development strategies, appreciation and appraisal are some of the important aspects for employees to be productive. There are plenty of articles written on this subject, including a book that provides insights from U.S. airline industry. If you feel academically inclined to further peruse this topic, do check MEL Institute. Here, Prof. Dover and Prof. Dierk have tried to quantify the competencies and highlight the challenges within organizations. I believe most of this is already happening and will accelerate further given how rapidly the healthcare ecosystem is changing. These are just few of the entrepreneurial opportunities within healthcare. More connected devices in the hospital and home will provide the data for patient analytics – access to data will be streamlined. Accountable Care Organizations (ACOs) results will prove the value in coordinating care of patients. Policy discussions will shift towards ideal regulatory oversight of mobile medical apps and stand-alone software. Medical device manufacturers and providers will embrace monitoring devices (including wearables and sensors) to care for the patient. Telehealth or telemedicine will gain more traction in 2014. Mobile apps with simple UI/UX to manage patient health data will proliferate and doctors will prescribe these apps to get patients engaged. Healthcare exchanges problems will get resolved bringing more patients into the healthcare system. Also interoperability standards and emerging frameworks will increase connectivity between networks. Digital health technologies – more wearable and sensor based devices for wellness, EHR adoption and tech-enabled tools for management of elderly + chronic care. The field of big knowledge will emerge where decision making and insights will have more importance than data analytics. Alternative sources of funding startups will increase – govt. grants, crowdfunding, incubators, non-traditional partnerships.